Welcome, to the new home of Knicks Fanatics. We’re dedicated to providing a comfortable multi-media home to a band of brothers and sisters who love to love their Knicks even in a down economy or a period when the fortunes of the Knicks seem upside down with little upside. It is a place where every view is welcome — welcomed to get slapped around as we collectively mine for the truth and undermine the lies. This is the spot where the debates get hot and heavy and sometimes pseudo-personal, but it is all out of love for our home team. The bottom line is that this is the thinking fans’ site. We have fans of all different persuasions including those persuaded by the pedestrian analyzes often promoted by the MSM (Mainstream Media). Whatever you believe, bring it and be ready to support it, because we’re just like the 2008-09 version of the Knickerbockers — when we are on our home court, we don’t play. In any event, I hereby christen this blog with some gems from the NBA Video Store. Enjoy. Let’s rock ‘n roll folks. when you could be giving us something informative to read?. Consumers can easily get more views on youtube by way of a large number of affordable expert services. Video | Knicks Fanatics <Liked it! twitter Lowest Prices Ideal Support. twitter Zero Password and also Not having Pursuing. twitter for less along with quick, Come on Enthusiasts for ones account. the internet without my permission. Do you know any solutions to help protect against content from being stolen? I am encountering difficulties with your RSS. I don’t understand why I can’t subscribe to it. Excellent beat ! I would like to apprentice while you amend your site, how can i subscribe for a weblog web site? asset valuations and purchase price allocations; goodwill impairment analysis). the cash comes from high-quality sources. pitch they created plenty but could not pull the trigger. will by no means cause harm to anyone but excess of almost everything is bad. these methods you are damaging Zynga, the provider in the game you love. a excellent task in this matter! have touches that reflect their creativity. Welcome to the new home of Knicks Fanatics, the best independent Knicks basketball blog for fiery and usually intelligent fellowship. Here you will find avid Knicks fans able and willing to defend divergent, convergent, emergent and subversive viewpoints. Through hard times and great times, our Knicks are our bond. Hop a squat and get comfy for 2010 is on its way, whatever the hell that might mean to you. And while you wait for that day (you’ll know it, when if you see it) feel free to enjoy our collection of sounds, videos and fave websites below. 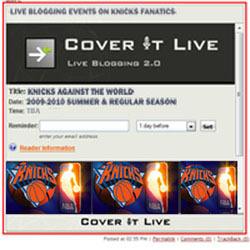 If you want the latest news without traveling the long route through the blogosphere, check out Knicks Klippings. For the latest in hot action, rummage through the Vodpod while you wait for someone to respond provocatively to your brilliant insight. And if you don’t have brilliant insight, please feel free to say something stupid, because according to most Fanatics anything that doesn’t come from their keyboard is stupid anyway. LOL. The 17-65 season, they could endure. The dealing away of franchise centerpiece Kristaps Porzingis, they could explain. And the embarrassments of the early stages of what they hope is a rebuild could be survived. Hidden in plain sight among the Knicks' player development season was the occasional glance around the locker room, wondering just who will be around to see how they developed.